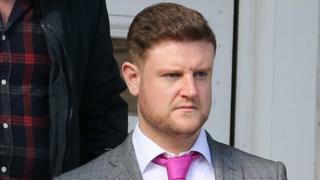 A man who fatally injured his 10-week-old son when he shook him so hard he fell into a coma has been jailed. Christopher Barnes, 28, was sentenced to six-and-a-half years in prison after being convicted of manslaughter. His son Harry died on 25 June 2017 from injuries consistent with being shaken. Barnes, of Barlavington Way, Midhurst, West Sussex, was also jailed for two years for causing grievous bodily harm without intent, after a trial at Lewes Crown Court. The heating engineer had been convicted by a majority verdict after a 10-day trial. Harry was admitted to Southampton General Hospital on 24 June after collapsing at home, but he did not recover. Det Ch Insp Emma Heater, of Surrey and Sussex Major Crime Team, said: "He never regained consciousness and died the next day after life support was withdrawn." She said told the court expert forensic pathologists had confirmed Harry's injuries were "consistent with baby shaking".